Tamika Mallory speaks at The Women's Convention. 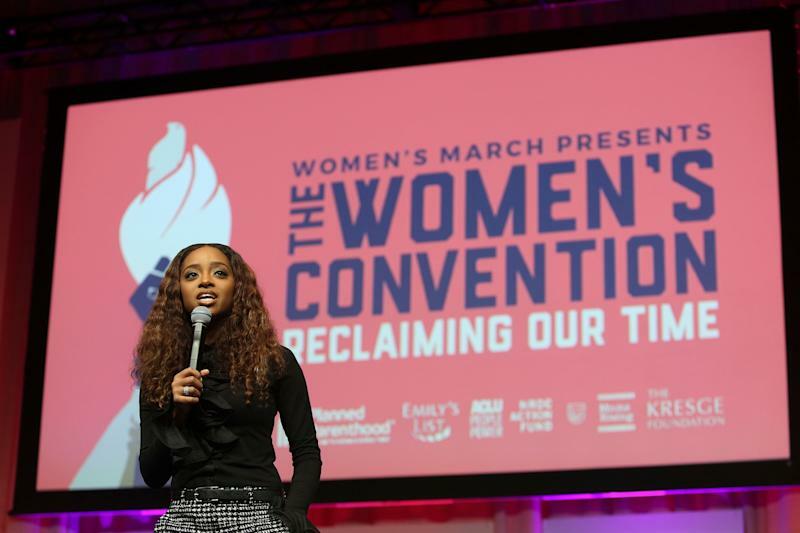 A week after thousands gathered for the inauguralWomen’s Conventionin Detroit, Tamika Mallory’s words shouldn’t be forgotten. “Black women are a key component to helping folks for the fight that we’re in,” the co-chair of the Women’s March told HuffPost days before the event. Mallory, who started her activist work as a teen, spoke about the importance of centering not just the convention ― aptly themed “Reclaiming Our Time” in honor of Rep. Maxine Waters(D-Calif.) ― around women of color, but activism, period. “I think that the importance of having black women centered in the conversation is because we know all too well what it looks like to be dealing with a plethora of issues and having to fight on many fronts,” she said, noting that this is especially important for organizers to understand in a time when many different identities are being targeted. In January, the Women’s March and participants receivedbacklashfrom folks who felt the demonstration wasn’t inclusive of women of color, despite the organization’s efforts to create an intersectional space. Others said that the majority of white women who attended were absent when it came to Black Lives Matter rallies. To avoid similar roadblocks during the convention, organizers centered their focus on black and brown women. They intentionally set the convention in a city with a large black population and created a local host committee for local black women to organize. Along with some local voices, Waters, political commentator Symone Sanders and other women addressed attendees over the weekend. Though the turnout was diverse, Mallory said it takes more than just showing up to make a difference. One challenge, for her, has been getting more black and brown people engaged in the fight. Another challenge has been with white women who don’t utilize the power they have to change attitudes in their own homes and communities. She said they must understand that the issues that negatively affect them have an even harsher effect on women of color. Ultimately, Mallory stressed the importance of everyone working together to uplift and fight for black and brown women.